Entrepreneurial U of T students are poised to reinvent transportation, e-commerce, emergency response and even how offices conduct meetings. 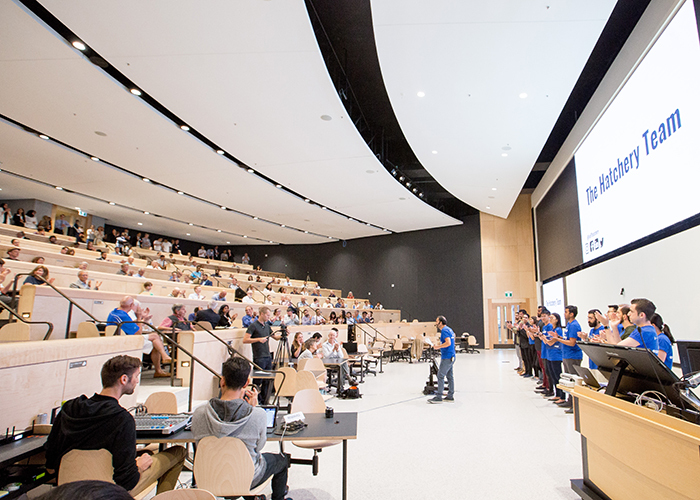 Thirteen student-led startups presented their business plans at the Entrepreneurship Hatchery’s sixth annual Demo Day, held on September 5 in the new Myhal Centre for Engineering Innovation & Entrepreneurship. Selected from more than 30 teams, the finalists pitched their startups to a panel of judges, including business leaders, prospective investors and U of T Engineering faculty members. Demo Day is the culmination of the Hatchery Nest program, a four-month accelerator which pairs student teams with experienced mentors and industry leaders to develop their businesses. Student teams receive detailed feedback on their business plans, explore their proposed market, learn about patents and marketing and build prototypes using 3D printers and other fabrication resources. A second program, Hatchery Launch Lab, focuses on supporting startups built on graduate-level research in the Faculty. This year, four startups took home a total of $42,500 in seed funding, composed of one $20,000 grand prize and two $10,000 runner-up prizes. A $2,500 Orozco prize is furnished through funds raised by the students themselves. This year, the Orozco prize was awarded through live audience voting via Pheedloop, an innovative event technology platform developed by alumnus Rahul Goel (EngSci 1T6) as part of the Hatchery. Finding parking can be stressful, especially in a high-traffic city or major destinations such as Toronto’s Pearson Airport or Yorkdale Mall. Drivers consume an average $350 on gas a year from slowing down and stopping to find parking spots. The current solution of installing light sensors at each parking spot is expensive, and still requires drivers to be physically present to find vacancies. And in many cases, drivers still have to compete for a spot. Grid’s solution addresses both challenges. Their idea is to install wide-angle cameras programmed with image recognition technology to detect available spaces and broadcast it in real time, so drivers can navigate to the available spot or reserve a parking space before setting out. The company would also provide parking lots with real-time analytics to inform them of peak hours, allowing for dynamic pricing. Sheikh says this prize will go towards their pilot testing, which begins next month. Smart speakers such as Amazon Echo and Google Home have altered the everyday habits of millions. But according to team Voco, these platforms still have a lot of room for improvement. Voco is a platform that allows content creators and advertisers to easily upload their content to all smart speakers: imagine an audio version of YouTube. Users would enable Voco, and then search and listen to the latest news from CBC, or hear Anderson Cooper’s thoughts on American politics, or search for their favourite stand-up comedy special. “The content would be more powerful and intimate when delivered from your favourite creators,” said Purchase. The team is currently partnering with content creators to develop their platform, with hopes of launching Voco in December on Amazon and Google. Knowtworthy thinks today’s professionals are inundated with team meetings that vary in effectiveness and productivity. Whether it’s an overwhelming quantity of information shared among a large team, a lack of structure, or a vague sense of deadlines and responsibilities, the team aims to run meetings better and smarter. The startup’s software provides real-time automated transcription of meeting minutes, instant action items that can be linked to team members’ calendars, and provides personalized reports to each member on how to improve their communication skills by providing metrics on a team member’s engagement or openness to ideas. Knowtworthy has already launched a beta version of their software, which is currently being tested by 100 users. The team is aiming to launch a second beta and hope to see 10,000 users by next year. When it’s a matter of life and death, every passing minute is critical. Zeroth Responders recognizes the challenges emergency services face when trying to arrive quickly: in Toronto, it can take more than 11 minutes for an ambulance to arrive at the scene of a health emergency. The startup envisions a future where response times can be greatly reduced by connecting 911 dispatchers with a network of qualified volunteers with certifications in CPR and first aid. Using the Zeroth app, volunteers nearest to the emergency would be alerted, providing them with directions to the location. If it was a cardiac arrest, for example, the app would alert a nearby volunteer who is equipped with a defibrillator, and would provide them with a line of contact with the dispatcher to ensure the patient is treated correctly. The Zeroth team, who won first place at this year’s U of T Hacks, hope to integrate their software with the Toronto emergency dispatch system by next year. This story originally appeared on U of T Engineering News.